Visit www.cookwithavonmore.ie for recipes for all occasions. The delectable taste of Avonmore Double Cream adds a splash of magic to all favourite dishes. 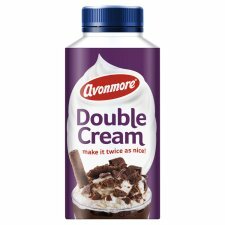 Make all your dishes fantastic with Avonmore Double Cream. At Avonmore, we know the secret to delicious dishes is simple, fresh, natural ingredients. Keep refrigerated between 0°C and 5°C. Once opened consume within 3 days & by use by date.